A Walking Tour of Male Spirituality is coming later this summer. 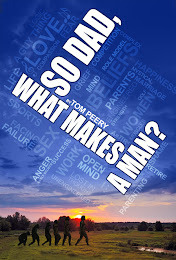 Based on So Dad, What Makes a Man?, it is not for men to model my behavior, but a workshop guideline to compare the topics I mention in my memoir with one's own experiences--to reflect on or discuss with a spouse or in an existing men's group. * This workshop was not like others I take in which I come away with lists of what I should do or how I should behave or pressure about attaining the learning objectives. Instead, talking about life was relieving. I felt a sense of God and spirit where everyone could be themselves. I felt accepted and felt God's love. * This experience was almost cathartic for me. Up to now I'd had no chance to stop and think about things. I had seen men taking a back seat at church. I used to want to control everything. This book made me think. It cleared a path through the forest of life, and the diversity in our group helped me clarify my own life. * This workshop came during a life change for me: retirement. Reviewing my thoughts about the questions, then writing them down, then talking about them helped me move through the transition. "I unintentionally rekindled my interest in drawing on another visit to the Rice University library. I bypassed the history section to look at their art collection. Again, the grandeur of the Italian Renaissance attracted me, and I began leafing through a book of Leonardo da Vinci's works. I came upon some of his drawings. They reminded me drawing was something I loved doing in grade school. Back home, I researched drawing classes for adults then enrolled in the fall semester of Houston's Glassell School of Art. I had no idea how much I was about to learn about myself. My first professor, Suzanne Manns, made being a beginner easy. She said something nice about anything I drew, no matter how awful it looked to me, and offered suggestions for improvement without any criticism. Suzanne was also quite perceptive. During my second week of classes, I drew a still life—a bowl of fruit—with charcoal sticks as she circulated around the room. She stopped beside me, observing my work for a few moments. At the end of that class, she assigned our homework: sit in front of our clothes closet and draw whatever we saw. I brought a chair and an easel into our bedroom and, anxious to respond to her suggestion to use more black, opened my closet and sat looking at my clothes. There was not one single piece of black clothing hanging in front of me. After ending my corporate life, I had packed up my white shirts and given away my navy blue suits. Now there were no shirts or pants that were dark-colored, let alone anything black. Thinking about her term mid-range, meaning with neither highs nor lows, very light or very dark, I saw that not only did I draw mid-range, I dressed mid-range. Thinking about it some more, I realized I also behaved pretty mid-range, avoiding highly emotional displays of either anger or joy. The next time I cooked, I found even my choices of food seasonings were mid-range. Nothing hot or spicy, or too flavorful. After I talked with Mance about these middle-of-the-road tendencies, she came home from shopping with a black shirt for me. It was the first I'd ever owned, and I began wearing it to art class. A few weeks later, Suzanne had us draw a cut-glass crystal goblet, which was sitting empty on a table in a bright floodlight. My perspective was okay, thanks to mechanical drawing courses at Mines, and it looked pretty good to me. Then the professor arrived. The black in crystal glass? I couldn’t imagine any. Glass is clear, not black. I looked again, with doubt. Picking up my black charcoal pencil, Suzanne stepped in front of my drawing and quickly made a few very short strokes in the lower curve of the brandy snifter. My drawing suddenly looked more realistic. “Draw what you see, Tom, not what you think is there. Look, there’s some white in there too,” and she picked up a white pencil and marked a few reflective highlights on the sides. Now my drawn glass really "popped out" and looked very realistic. But I had to compare her marks on my drawing with the crystal glass itself before I saw that there were tiny black shadows and white reflections in the glass, right where she had put them on my drawing. I had drawn what I thought about the glass, rather than what was actually there. At home later, I sat petting Genny in the backyard, thinking about that. "Not what you think is there," Suzanne had said. Well, I knew I had done plenty of worrying and imagining and planning in my life, but I had only recently begun trying to quiet my active mind with meditating. And hadn't that helped me better see the world around me? Yet I had looked at that crystal glass and told myself what it looked like, without really seeing what was there. Do I do the same in other parts of my life? Have I spent the first forty-nine years of my life looking at the people around me with such prejudice? Does my mind not see what is actually there?"